The TAKHOMACARD® must be activated through a completed transaction - please keep your receipt. 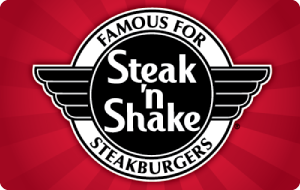 You can reload your card at participating Steak 'n Shake® restaurants or at steaknshake.com. The card cannot be redeemed for cash and is only valid at participating Steak 'n Shake® restaurants. Steak 'n Shake® is not responsible for lost, stolen, damaged or unauthorized use of cards. The card has no expiration date, but after 24 months of card inactivity, a $1.50 per month service fee will be deducted from the card's balance until depleted, except where prohibited or restricted by law. Inactivity fees are charged based on the state in which this card was purchased. Use of this card constitutes acceptance of these conditions. All Gift Card transactions from the Steak 'n Shake® website are conducted in the state of Indiana, and follow Indiana Gift Card commerce regulations.